Break out the broken block using a 3 lb. hammer, being careful not to damage any surrounding blocks. It is best to start in the middle of the block and work your way out. A concrete masonry chisel can help as well. 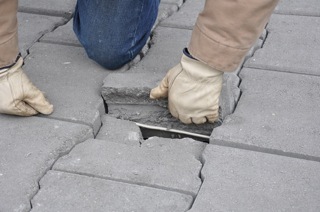 Adjust the PaveDrain Extractor so that it will pick from the two flat sides of a PaveDrain block. Pull and move handle of extractor back and forth to remove damaged block. Once the damaged block is removed, debris should be cleaned out of area. Use the PaveDrain extractor to install the new block. 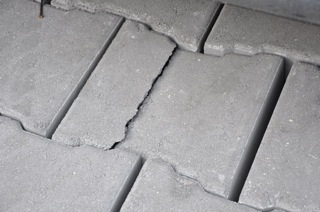 If a PaveDrain block breaks under pressure or sudden impact, it is easy to replace the single block without having to pull out the entire mattress. Follow these steps to repair and single block. First, hammer out the broken block using a hammer, being careful not to damage any surrounding blocks. It is best to start in the middle of the block and work You way out. 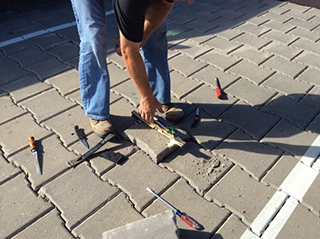 Once You have loosened the concrete, begin to pull out the pieces by hand, removing all of the block from the area. If there are still pieces that are stuck, continue to use the hammer to break them free. Once the block is free, perform one final check to clear the wires and any block remnants that may have collected under adjacent blocks. Now that the damaged block is fully removed, You are ready to place the new block in. Line up the replacement block to fit the hole where the old block was. Slide the new block down into place. You may use a rubber mallet to tamp it down securely at the edges, again be sure not to damage the new block by using too much force.